The 21 mile walk is looming and we are all getting ourselves ready here at Stock N Lock to take on the challenge! 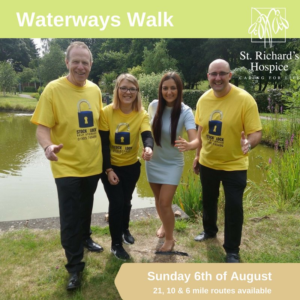 We are raising money for an amazing local charity; St Richard’s Hospice.St Richard’s Hospice cares for patients and families in Worcestershire who are living with life-limiting illnesses. Each year they give free care and support to around 3,000 patients, loved ones and the bereaved – helping them towards the best quality of life possible. There is still time to donate!! Please click the link below to sponsor us… any donation will be much appreciated!